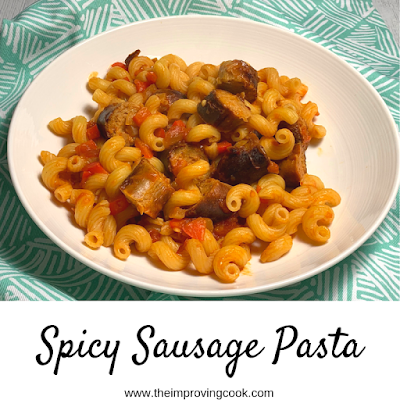 Spicy Sausage Pasta- a simple pasta dish with grilled Cumberland sausages and a spicy tomato and red pepper sauce. A delicious, comforting dinner. This spicy, sausage pasta recipe is just the thing to keep your family warm on a cold, wintery evening. It's pretty quick to make with grilled sausages in a tomato- based sauce and a bit of spice from the crushed chillis. It's easy to make and can be doubled to feed a crowd, if needed.